people. In such an environment, transaction, between functions often. were done manually, which was tedious, slow, and a source of additional errors. As a result. each of the functional areas within an organization was viewed as an independent operation. as illustrated in Exhibit. 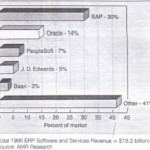 To address this issue of incompatibility and multiple databases, ERP systems were developed to provide an infrastructure with a common information technology platform that would not only electronically link all of the functional areas with a single database, but also address their individual needs, as shown in Exhibit Exhibit 4.4 illustrates how SAP, the leading ERP software firm. specifically provides this integration.